FOSTER 83-13HM ZP Adhesive is very low odor and has excellent swirl spray or extrusion capability. It may be applied at relatively low adhesive temperatures while still maintaining a long open time when applied to either the insulation or direct to the facing* material. FOSTER 83-13HM ZP Adhesive is packaged in convenient Zero-Pack bags of adhesive pillows. The ZP bags allow for easy addition to the hot melt tank by dropping the entire bag into the melt tank or by opening and adding individual pillows. FOSTER 83-13HM ZP Adhesive meets NFPA 90A and 90B 25/50 requirements. FOSTER 83-13HM ZP Adhesive is 100% solids, solvent free and meets requirements for LEED 2009 IEQ 4.1 Low-Emitting Materials, Adhesives and Sealants. VOC: 0 g/l, less water and exempt solvents. 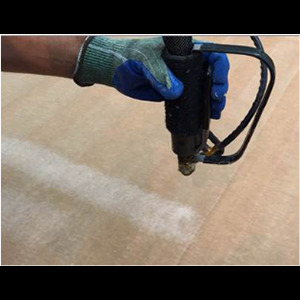 To prevent charring keep insulation dust and other contaminants out of adhesive. Keep hot melt tank covered at all times and keep boxes of unused adhesive closed or in dust free storage. Maintain tank, hose and tip temperature below 325 ° F. When adhesive will not be used for extended periods of time turn off heat or reduce temperature to below 200 ° F. Do not leave adhesive in tank hot overnight. * For best results, and to avoid wrinkling with Saran or other temperature sensitive facings, apply the adhesive directly to the insulation rather than facing. Applied to 1/4 inch (6.4mm) inorganic reinforced cement board. The flame spread may vary at different product thicknesses and/or when applied with on other substrates. TM TradeMark of H.B. Fuller Construction Products Inc.